As the year draws to a close, the WTA stops in one of its last remaining indoor strongholds – Linz. The second largest city in Austria has held a WTA tournament since 1991 and many illustrious names are amongst its list of winners (e.g. Pierce, Davenport, Henin, Sharapova, Ivanovic, Kvitova, Azarenka.. and – imagine Pam Shriver saying this – WICKmayer). Over the last two days, event manager Sandra Reichel had to deal with quite the blow when her two big stars – Ivanovic and Bouchard – withdrew after the first round, presumably to get healthy in time for the WTA Finals in Singapore. With the WTA Finals and the Tournament of Champions both moving/having moved to Asia, the last three events (Linz, Moscow and Luxembourg) of the once major European indoor autumn swing are going to be fighting an uphill battle. Most of the Top 20 players will not be interested in traveling back and forth between Asia and Europe for a tournament or two. We miss you, Ai. We miss you, too, Patty. What was Chanda Rubin doing in Linz in 2006? And WHAT was Ana Ivanovic wearing? In 2007, things got a little more formal. And everyone got a bottle of wine. Except for Tatiana “Tati” Golovin. Oh Agnes. Oh Nadia. Oh Ana. This is why Linz is the best. 2009 followed dirndl suit and delivered more of the same. Alexandra Dulgheru showed off her moves. And Barbora Zahlavova Strycova (aka Beezus) got a special surprise from a singer. Zahlavova Strycova was likely still emotionally scarred from the previous player party. Anastasia Rodionova is to her left and then-player/now-commentator Anne Keothavong to her right. After years of Dirndls, the tournament director decided to go ALL Red. A year later Taylor Swift released her most successful album to date, “Red”. After a classier theme, Linz brought back the dork-factor with a vengeance and equipped the women with sparkly hats, leather jackets, a motor bike and a slot racing track. Never change, Linz. Two years later everyone wears biker jackets in autumn. 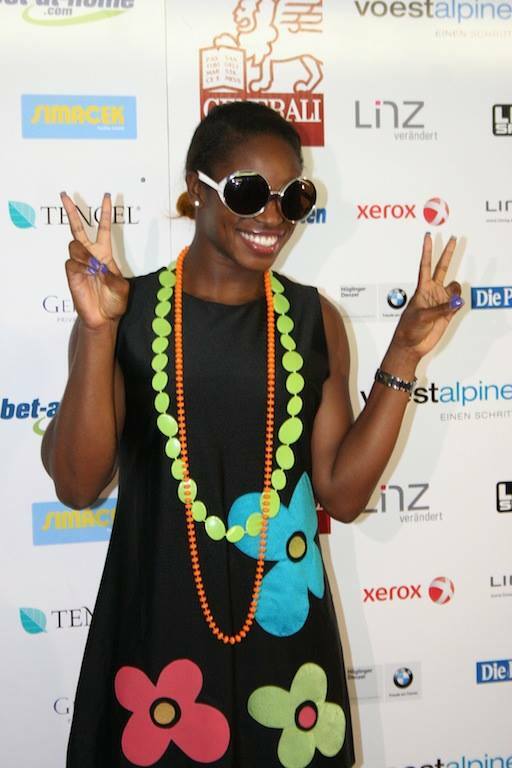 After the 70s madness of 2013, this week’s edition of the WTA tournament in Linz had less emphasis on the crazy and more on grace. Allegedly. And this is why Linz needs to last. Any other questions? No? Thought so.